Tiger Woods fired his lowest round in two years on Thursday, launching his quest for a place in the Fedex Cup play-offs with a sparkling six-under-par 64 at the Wyndham Championship. Woods, bidding to bounce back from a disappointing missed cut at last week's PGA Championship, roared back to form with seven birdies and a bogey at Greensboro's Sedgefield Country Club. The performance was the former world number one's lowest on the PGA Tour since a second-round, nine-under-par 61 at the 2013 World Golf Championships-Bridgestone Invitational. It was also Woods best score in an opening round in three years, when he carded a 64 on the opening day of the 2012 Deutsche Bank Championship. The round left Woods two off the lead, behind William McGirt, Erik Compton and Tom Hoge, who all carded eight-under-par 62s. Woods, who is playing the Wyndham Championship for the first time, needs to win this weekend to force his way into the post-season picture. A victory would guarantee him a spot in the first leg of the four-tournament playoffs, although a solo second finish could also be enough to elevate him into the top 125 players eligible for the post-season. 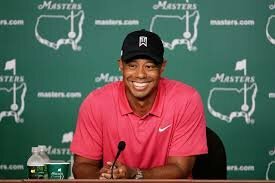 A relaxed and smiling Woods, showing no sign of the gloom which has enveloped his game this year, said afterwards his putting display had been key to the round. "I felt very good out there today. I hit a lot of good iron shots, made some putts, a round that probably could have been two to four-under-par turned into six," Woods told reporters. "Finally I got something out of my round. "My iron play was very solid but it was nice to finally get some putts going in and on top of that it was nice to make some par putts. "It's nice to make birdie putts but I think those par putts are probably -- I feel more energetic when I make those putts than I do a birdie." Woods insisted that despite his disappointing performance at Whistling Straits he had always believed a return to form was within reach. "I know it's crazy to say but I wasn't playing that poorly at the PGA. Today I felt the rhythm of the round and felt that I was starting to feel the numbers, hitting the ball right on the number, the right shape, hold the ball on the hills on tee shots. I was getting into the flow of the round." Teeing off on the 440-yard par-four 10th, Woods set the tone on his opening hole, chipping in from 54-feet for his first birdie of the day. He stumbled with a bogey on the next hole, but reeled off three more birdies in his outward nine to be three under at the turn. Three more birdies on the back nine -- including birdie putts of six feet, 11 feet and seven feet -- put him at six under before he curled home an 11-footer to save par on the last to complete a fine morning's work. Just ahead of Woods were a cluster of three players -- Jim Herman, Morgan Hoffmann and Derek Ernst -- tied for fourth on seven under after carding 63s, one clear of Woods, Germany's Martin Kaymer, Sweden's Carl Pettersson and Davis Love III tied for seventh.